We are constantly adding new artifacts to the Museum collection through purchases, sponsorships and donations. 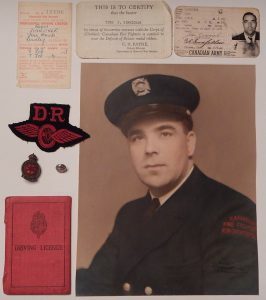 The late John Zinnicker, was “Leading Fireman” with the Corps of Canadian Firefighters, 1942-1945. Carrying badge number T393, John was trained and licensed to drive the fire truck. Note his British license in the photo at left. The Museum is very grateful to John’s son, Doug Zinnicker, for the donation of these and several other items which are helping us to tell the story of the Corps. 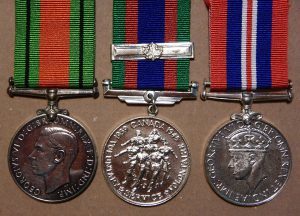 L to R: The Defence Medal – for defending Britain; The Volunteer Medal, with bar – for voluntary service; The War Medal – for all who did full-time service. Chair, Will Lambert, recently discovered these medals of the Corps of Canadian Firefighters on Kijiji. He purchased them and donated them to the Museum to be added to our ever-expanding collection of Corps items. • The War Medal – for all who did full-time service. 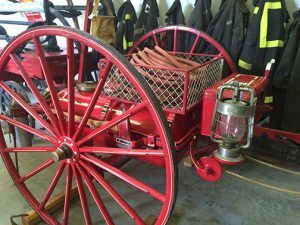 Recently, the Ontario Fire College, Gravenhurst, generously donated dozens of firefighting artifacts from their former museum exhibits. We have included some highlight items below. 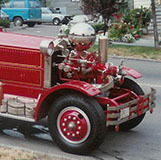 This photo shows a similar pump mounted on an Ahrens-Fox truck. 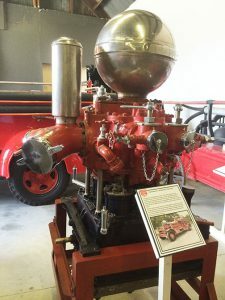 You might be asking, “What is that?” This impressive piece of equipment is a pump from a circa 1930 Ahrens-Fox Pumper Truck where it was mounted in front of the engine! Ahrens-Fox has been referred to as “The Rolls Royce of Fire Engines.” This pump has had sections of its casting cut away as it has been used as a display piece to show the inner workings of a pump. We have no information at this time, as to what happened to the rest of the truck but we’re thrilled to have this pump in our exhibits. 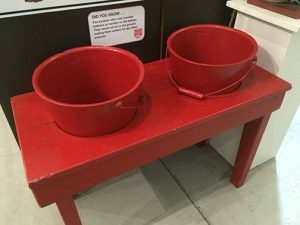 Specialized fire buckets have been in use for centuries, often constructed with round or conical bottoms which ensured they could only be used for fighting fires as they would not sit upright and needed to be hung ready to fight fires. This bench represents another solution, having two large holes to hold the buckets! More information on fire buckets here. 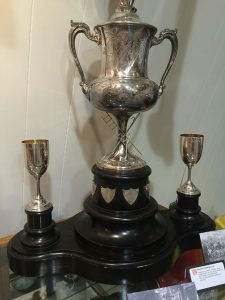 This impressive commemorative trophy, “The Weddell Challenge Cup” was first presented by Trenton, Ontario’s first fire fire chief, R. Weddell, August 1st 1910, to the winners of the “Fireman’s Hose Reel Race.” It was last presented in 1916. A double cylinder chemical cart with hose and lanterns. A beautifully restored “chemical cart” with two chemical tanks. These were often kept on hand to help fight fires at large estates or public buildings. More information on fighting fires with chemicals here. A section of riveted leather fire hose. 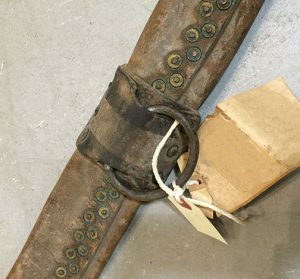 A section of an early riveted leather fire hose. The rings were used to suspend the hose over roads and objects as well as for hauling the hose into position. NOTE: We are unable to accept donations of artifacts at this time until further notice. We cannot accept artifacts containing hazardous materials.